On January 21, five members of the Indigenous Mphaa People´s Organization (OPIM) requested an appeal of the arrest warrants which led to their incarceration by a federal judge. The 5 members, who are human rights defenders, were detained on April 18, 2008 and accused of killing Alejandro Feliciano on January 1, 2008. On October 15, 2008, the Eighth District Judge in Acapulco, Livia Lizbeth Larumbe Radilla, granted an appeal to 4 of the 5 detainees. However they were not freed and on November 3 the Federal Public Prosecutor submitted an appeal which overturned the decision without presenting new evidence in the case. In their press release the Human Rights Center of the Montaña Tlachinollan (CHDM Tlachinollan) stated that “As a Human Rights Center we hope that the Eighth District Judge grants the appeal to the five accused because it has become evident that there does not exist sufficient evidence to continue the investigation and maintain the arrest warrants, all of which is corroborated by the appeal granted on October 15 of last year”. The CDHM Tlachinollan also added that there are 10 other people, the majority of whom belong to the OPIM, who are accused of the same crime and that they will be submitting an appeal within the next few days. 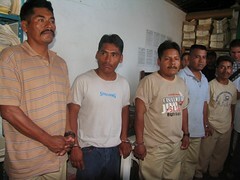 On September 3, 2008, Jacinto Solís Vázquez, a member of the Council of Ejidos and Communities Opposed to the dam La Parota (CECOP, Consejo de Ejidos y Comunidades Opositores a la presa La Parota), was detained by agents from the Ministerial Police (PIM) who transported him to the Las Cruces detention center in the municipality of Acapulco, Guerrero. Solís was detained under a warrant which had been cancelled in 2004 after an appeal was made. After 20 hours in police custody, he was released despite the fact that the Sixth Court (of the penal branch ascribed to the detention center in Las Cruces) justified the arrest stating that the PIM agents were unaware of the fact that the arrest warrant was no longer valid.